Milsons Point is a suburb on the lower North Shore of Sydney, in the state of New South Wales, Australia. The suburb is located 3 kilometres north of the Sydney central business district in the local government area of North Sydney Council. Milsons Point is also the geographical feature that juts into Sydney Harbour from the northern side, directly opposite Sydney Cove, the spot where the first European settlement was established in 1788. Milsons Point was named after James Milson (1783–1872), one of the earliest settlers. Sketch map of the Kirribilli area first published in 1955 in the book "The Life and Times of James Milson" showing approximate location of Milson's residence and that of his son-in-law William Shairp who married Milson's daughter Sophia in 1827. The perforated line marks the approximate boundary between Milson's 50 acres in the north and Campbell's 120 acres in the south. Milsons Point was named after James Milson (1783–1872), a free settler originally from Lincolnshire. Milson settled in the area near Milsons Point and established a profitable business supplying ships with stone ballast, fresh water, and the produce of his dairy, orchard, and vegetable gardens. In the early 1820s Milson settled in the vicinity of Jeffrey Street, Kirribilli, on 120 acres of land he leased from Robert Campbell (1769–1846). In 1824 Milson received a 50-acre grant of his own adjoining Campbell's land (which is marked on the 1840s map above). In 1826 a bushfire raged through the area destroying Milson's home, orchard and dairy and farm which he subsequently rebuilt (refer to 1840s map). In 1831 Campbell was involved with Milson in a court action over Milson's non-payment of the lease of the 120 acres. Milson lived in the vicinity of Jeffrey Street until 1831 when he built a new home, "Brisbane House", on his 50 acres facing Lavender Bay. The next home he built, also on his 50 acres, was called "Grantham". By the 1840s Milson was leasing only the portion Campbell's 120 acres that contained Milson's orchard in the vicinity of Jeffrey Street. In 1872 Milson died at home at "Gratham" in the modern suburb of Milsons Point in what was then called the Municipality of East St Leonards. The last of the family's holdings in the lower North Shore area were resumed in the early 1920s for the construction of the Harbour Bridge and associated roadways. In the 2016 Census, there were 2,158 people in Milsons Point (State Suburbs). 40.4% of people were born in Australia. The next most common countries of birth were England 7.0% and China 5.7%. 56.0% of people only spoke English at home. Other languages spoken at home included Mandarin 8.0% and Cantonese 7.6%. The most common responses for religion were No Religion 34.4% and Catholic 19.0%. Milsons Point supports the northern end of the Sydney Harbour Bridge. Milsons Point is well connected with the CBD of Sydney by the bridge, ferries and trains. The Warringah Freeway provides a link south to the Sydney CBD and north to Chatswood. Milsons Point railway station is on the northern approach to the Sydney Harbour Bridge. The Milsons Point ferry wharf, serviced by the Balmain, Pyrmont Bay and Rydalmere ferry lines, is located to the west of the bridge in the south-west part of the suburb. In addition to rail services, Milson's Point is serviced by buses that run to the Lower North Shore and Northern Beaches. School Buses leave from Bradfield Park to transport students to schools in North Sydney. Milsons Point has a mixture of residential and commercial development. Milsons Point has the entertainment centre Luna Park and the North Sydney Olympic Pool. Schools in the area include the Catholic schools Loreto Kirribilli for girls and St Aloysius' College for boys. Earliest detailed map of Milsons Point (left) and Kirribilli Point (right): an 1840s subdivision map for the Estate of Robert Campbell (1769–1846). Improvements shown on the map are Milson's dairy and orchard located to the north of Milsons Point. Postcard of Milsons Point. The caption reads: "Milson’s Point – Probably in the early Seventies [1870s]. Kirribilli on the farther shore. Eastern Road Wharf is front. Alfred St to the right, the Arcade and clock are within (illegible)ing distance of the spreading tree." ^ a b Australian Bureau of Statistics (27 June 2017). "Milsons Point (State Suburb)". 2016 Census QuickStats. Retrieved 21 December 2017. ^ Warne, Catherine (1984). "Thrupp's Acres". Pictorial History, Lower North Shore. Kingsclear Books Pty Ltd. ISBN 0-908272-83-9. Retrieved 28 January 2013. ^ "Walk 1 – Kirribilli from Milsons Point Railway Station" (PDF). North Sydney Historical Society. 1994. Archived from the original (PDF) on 27 February 2012. Retrieved 28 January 2013. ^ a b "Campbell v Milsom". The Sydney Monitor, Wednesday 5 October 1831, p.2. Retrieved 28 January 2013. ^ "On list of lands granted and reserved by Sir Thomas Brisbane dated 10 August 1824 (50 acre grant by Governor Sir Thomas Brisbane to James Milson)". Fiche 3269; 9/2740 p.19. Colonial Secretary’s Papers, 1788-1825 (held in State Records of New South Wales). 10 August 1824. Archived from the original on 25 April 2013. Retrieved 28 January 2013. ^ "Report of the Bushfire". Sydney Gazette. 29 November 1826. Retrieved 28 January 2013. ^ "A walking tour from Milsons Point to Careening Cove" (PDF). North Sydney Council. 2008. Archived from the original (PDF) on 30 April 2012. Retrieved 28 January 2013. ^ Hoskins, Ian (2008). "Kirribilli". Dictionary of Sydney. Retrieved 28 January 2013. ^ a b Robert Campbells Estate, Milsons Point and Kirribilli, Sydney (Map). Scale indeterminable. [184-?]. 1840–1849. Map of peninsula at North Sydney showing leases, roads, weather board cottages, jetties, wells, orchards, bee hives, barns, milking bails and stables and the graves of the three typhoid victims from the Surry. inset. Amicus Number: 8560781. ^ "James Milson Death Notice". Empire. 28 October 1872. p. 1. Retrieved 28 January 2013. ^ Pollon, Frances, ed. (1990). The Book of Sydney Suburbs. Australia: Angus & Robertson Publishers. p. 174. ISBN 0-207-14495-8. ^ "Milsons Point Railway Station group". New South Wales State Heritage Register. Office of Environment and Heritage. H01194. Retrieved 18 May 2018. 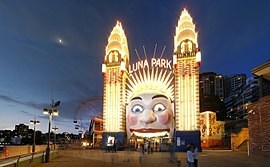 ^ "Luna Park Precinct". New South Wales State Heritage Register. Office of Environment and Heritage. H01811. Retrieved 18 May 2018. ^ "Sydney Harbour Bridge, approaches and viaducts (road and rail)". New South Wales State Heritage Register. Office of Environment and Heritage. H00781. Retrieved 18 May 2018. Wikimedia Commons has media related to Milsons Point, New South Wales. This page was last edited on 30 November 2018, at 08:30 (UTC).